I'm trying to keep my recording setup as efficient as possible. I don't have a car so all my travels will be on foot, by bus/train, or by bicycle. My budget can't stretch to getting a dedicated portable recorder yet (had my eyes on the Tascam HDP2) but I do have a portable laptop, hard drive, Apogee Duet (bus powered) and some microphones. The quality of this setup is great, but it has a few disadvantages over a portable recorder. I'm trying to look for some decent quality, but very lightweight, microphones stands. It looks like I'll need two really, but the usual ones (of any decent quality) seem to be 3 to 4 kilograms plus in weight. Putting two of these together on my back, along with all my other stuff will make it a little tricky to bike anywhere with my stuff. I've only really seen cheap mic stands that are more like 1 to 2 kilograms in weight. Any suggestions? As for a mic stand bag to hold them in, I was looking at the Gator GX-33 which seems good. Does anyone have one? Are they decent quality? ...it holds microphones too (which is handy) but I can't tell if it'll hold a Rode NT4 and after emailing the company, I never got a reply. Any views on a decent microphone stand bag to put on my back so I can take it around easily would be great. And then a laptop bag (I don't ask for much do I? ;) ... I'm looking for a good quality flip over laptop bag to hold my MacBook Pro 15inch. The idea being I can close the lid of the laptop, close the lid of the bag and take it to the next location... When I'm at my location, I'll flip open the bag lid, flip open the laptop, pull out the microphones/stands from my bag on my back, setup and record. Obviously, I have looked around for such bags, but was curious if anyone has one that is ideal for this sort of thing? May work for your application or not, totally depends on your surroundings. Imagine it wrapped around your handlebars, a tree limb, a stump, a flagpole, etc. You get the idea. Very light and easy to pack. Regarding bags, there are a plethora of official laptop bags to choose from but the first one that came to mind was a 3-ring binder bag we just picked up for back-to-school. It's not a laptop bag but could probably be modified to fit one, it's durable, has the kind of top opening you're looking for, and it's CHEAP. Sorry don't have a link for that, but just check out one of the big box stores (Target, Staples, etc.). What are your recording applications? It might be easiest to carry a carbon fiber short boom pole and just hold it as needed. I also second birdhousesound's suggestion of the Joby tripod, just make sure you have some kind of shock mounting for the mic and you should be golden. And don't buy an off brand - they snap very quickly with just a little use! As far as bags, I love my Petrol bag for recording. Has a very comfortable strap and a nice optional harnass. You might get more mileage out of a small Pelican case that fits your mics and recording input. They even have some for laptops that you can flip open and work out of on location. They're water proof, have pressure release and you can hit them with a car. Minimal weight for great protection. Get that and an old military style backpack, and you'll be set for any conditions. Alternately, get a Zoom HN4 as your recording device. By the time you buy cases and bags, you'd probably have spend the $300 US to get one. 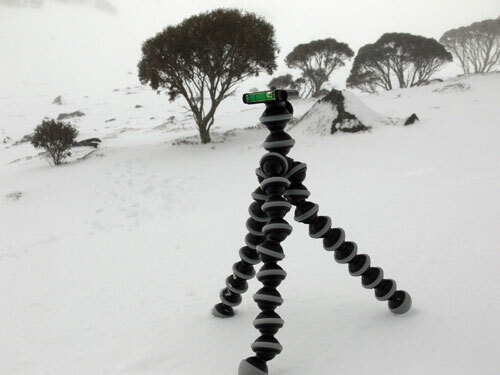 The Gorillapod will only hold something like a Zoom H2 before getting unstable; for larger rigs, the Gorillapod SLR is beefier and may fare better. My strategy is to have all my grip equipment be less than 19" when collapsed, so that it all fits in a backpack. I did hours of research and found that most shoulder and backpacks are only 14-18" in their longest dimension. If you carry a boom pole, a mic stand (or two), a mic boom arm (or two), and a big ol' windscreen, strapping all that externally to a bag is a nightmare. I'm a fan of laptop sleeves, because then the design of the bag can be a big more variable. Plus, it's something to set it on when needed. Don't be shy about looking into a laptop sun shield, it can make the difference between being able to use it or not in some conditions. There's no one perfect bag for every person or every task. I use three strategies based on what I'm doing: I strap a boom pole to a shoulder bag, like a Petrol or a Portabrace, when I'm running and gunning or just hopping out of the car or house for a short session. I carry a big Chrome backpack (the biggest size) and just put everything in it - no dividers for maximum space, but a few internal pockets to stash the little things. If I'm traveling or really trekking to a location, I'll put stuff in and on a photo backpack with internal padded dividers. Not the answer you're looking for? Browse other questions tagged kit-bag microphone travel or ask your own question. What sounds can be effectively recording using just one channel (mono)? Field Recordists - How do you protect your mics on the way to the field? Courtroom microphones for electronic audio recording of proceedings? Looking for a compact portable active powered speaker, such as a Behringer 205D, for small live gigs. How can I improve sound quality? Lightweight Quality Field recording package? Need a good mic for screencasts. Are USB headsets less likely to pick up computer line noise, and are wireless ones even more so?